Every year, watch and jewellery brands present all new selections of timepieces and gems over at Baselworld in Switzerland. One of which includes Chanel and its luxurious Code Coco watches that’s frankly out-of-this-world beautiful (and covered previously here), with today’s spotlight firmly on Rolex that has introduced several new pieces to its wildly popular Oyster Perpetual collection. Aside from the Yacht-Master which now comes in a 42 mm size in white gold and a Cosmograph Daytona decked out in an elaborate dial and gem-set bezel, Rolex unveiled 5 new models of the Day-Date 36, all of which are equipped with the calibre 3255 movement that’s known for its high levels of chronometric precision. 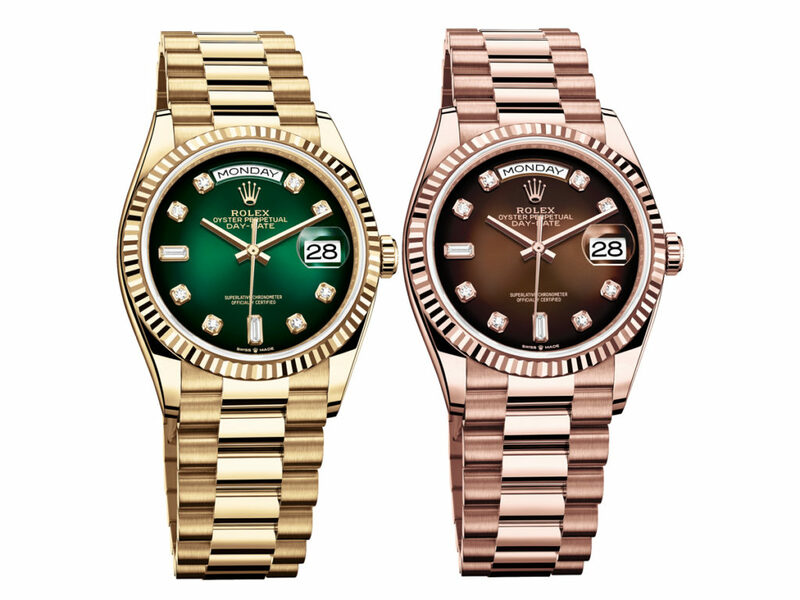 It’s worth mentioning that these models above do not come in Oystersteel but rather precious 18 ct Everose (pink), white or yellow gold, also known as the perfect wrist candy for those of you looking for a truly luxurious piece from Rolex. Starting with 2 designs that feature concentric gradient dials, a Green Ombré in 18 ct yellow gold (SGD46,550) or Brown Ombré in 18 ct Everose gold (SGD50,220), both come with diamonds set in place of the typical numerals. 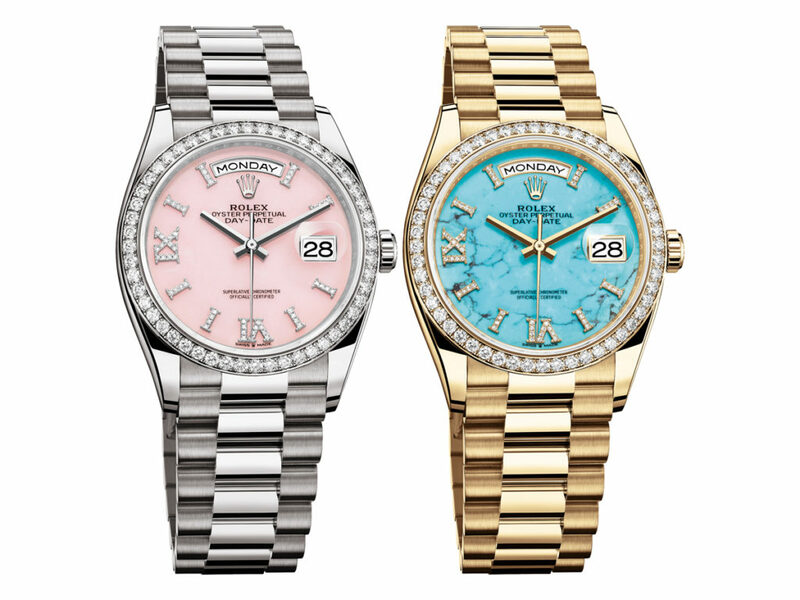 The next two models are furnished with decorative stone dials in either Pink Opal (in 18 ct white gold) or Turquoise (in 18 ct yellow gold) and Roman numerals inlaid with diamonds. 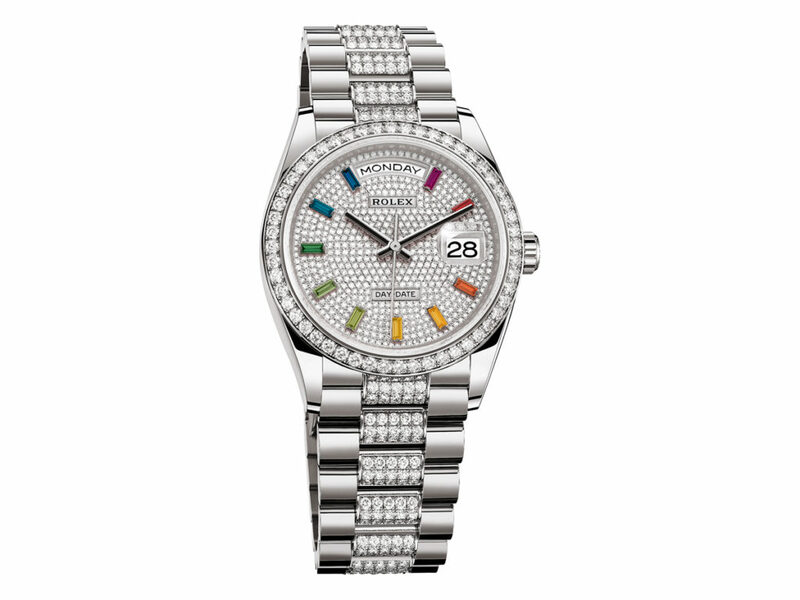 To make it even more special, Rolex gives it a stunning bezel that’s set with 52 brilliant-cut diamonds all around for that extra sparkle and shine. Last, but by no means least, the precious version in 18 ct white gold which comes with an entirely diamond-paved dial and rainbow bageutte-cut sapphires marking the hours. And if you’re wondering, yes the bezel comes with 52 brilliant-cut diamonds and the centre links of the bracelets are set with 412 brilliant-cut diamonds for the inner diamond lover in you. There’s a reason why these timepieces are dubbed as the President’s watch, and worn by numerous visionaries and world leaders alike. The bracelet also differs from the typical Oyster or Jubilee, coming in the President Bracelet (and fitted with Rolex’s signature concealed Crownclasp) that’s reserved only for the Day-Date and specific versions of the Datejust. Gorgeous looks aside, the Oyster case is waterproof to 100 metres with a power reserve of approximately 70 hours. The 36 mm diameter is also perfect for men and women alike, one that will sit beautifully on anyone’s wrist.